Is it a Kaleidescope Cactus? It looks like it could have been created in one? Reminds me a bit of a Tent Caterpillar (Malacosoma). But everything seems a bit off for that. What is it really? wow. My first reaction to this was... caterpillar too! 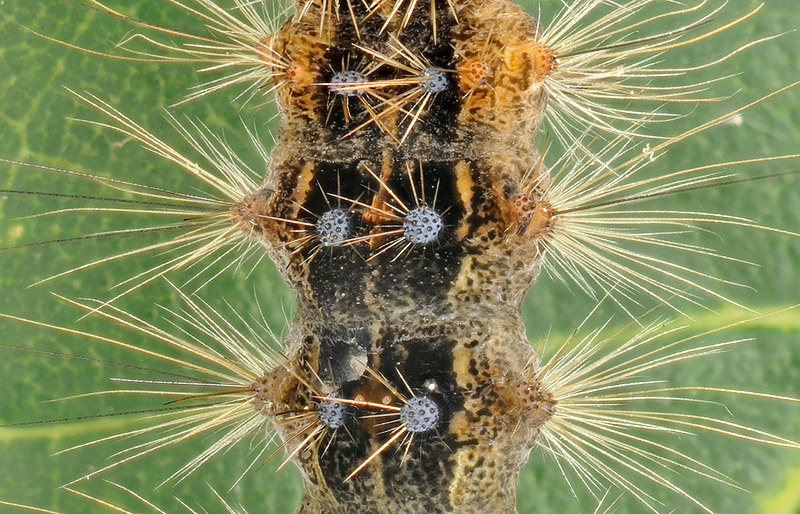 Yes, it sure looks like a couple of segments from a Gypsy Moth caterpillar but I prefer Elf's interpretation: a "Kaleidescope Cactus". Below is the full frame from which the crop was made. 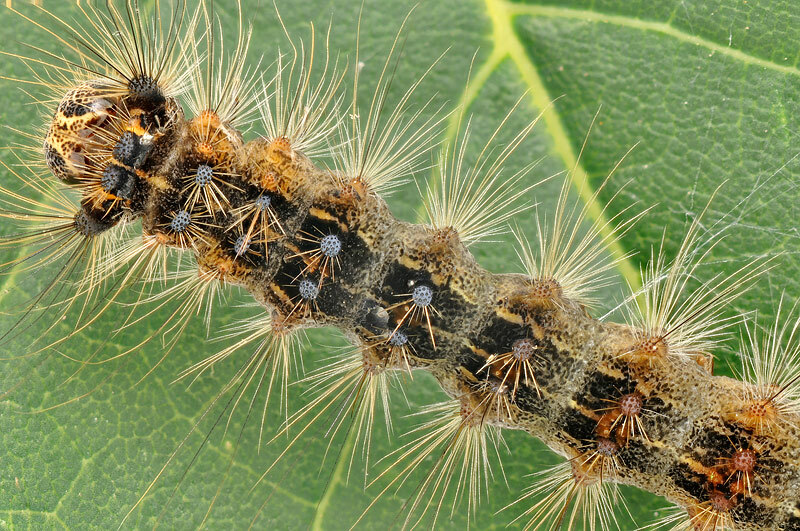 Gypsy Moths are odd in that, introduced into North America (from Europe) where they have reached pest status and are surviving pesticide assaults, they have become extinct in the UK. Gypsy moth, eh? That would explain my ignorance -- I've never seen one of those. Poking around on the web, I can't find anything that quite matches this pattern of tubercles and coloration. Do gypsy moths have a lot of individual variation, or change appearance a lot as they molt? By the way, what's the technical information for this beautiful image? I'm presuming it's stacked, but how and where? RE: ID. Hey Rik don't scare me like that! Never really thought about it, just intuitively knew (thought I knew) it was a Gypsy Moth. Technical stuff: basic;D90 200AF Micro Nikkor (used MF), 57 frames @ 0.1mm, ZS PMax (what else would anyone use?). Feeding on a Maple leaf, too windy outside so brought it indoors. Actually it was incredibly docile - in fact too docile. It was alive and feeding when collected, next morning it was on this leaf and did not move a whisker - was dead the next am. Quite certain it was infected with a virus; that's a good way to keep bugs still. Simple questions can lead to complex answers, wish I had kept it as a Kaleidoscope Cactus.